What's cooler than playing Asteroids? Simple: Making your own Asteroids game and playing it on your own Homebrew 6809 Computer! 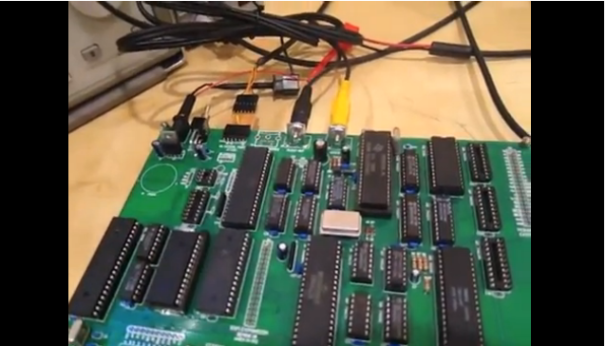 YouTube user and computer programmer Matt Sarnoff apparently decided that it would be cool to do just that and he has built himself his very own 8-bit computer based on the Motorola 6809E. He also wrote his own code for his own Asteroids game. When Matt first started building his 6809 he uploaded this video to YouTube. That was about a year and a half ago. Back then, his computer was in its very early stages, it had no memory, and he had to enter machine code by hand. Today, the computer is much more advanced: It can support color graphics, play music (Ataris ST), and it can run games that Matt wrote himself. Having evolved from the breadboard, Matt's homebrew 6809 now runs on an Ultimate PCB, which reduces signal noise from the system. With the PCB, Matt was able to write his first graphical game for the computer. To show off his creation, Matt wrote a version of Asteroids using Assembly language, a low-level programming language (this guy is crazy--in a good way). Using spectograph readouts of the original Asteroids sound effects, Matt was able to recreate (very closely) the original Asteroids sound effects on his 6809 computer. This is definitely one of the most awesome things that anyone has ever made. Make sure to check out the video of Matt playing Asteroids on his 6809 (he also has a pretty hilarious and nerdy Webcomic, so check that out, too!). I can only think of one thing that Matt needs to top this: Asteroids Wall Decals.